The facility sits on a 16.3 acre campus and work performed there will focus on advanced design, vehicle engineering, advanced powertrain development, urban mobility and manufacturing processes, and testing. Upon completion, the nearly 355,000 SF Advanced Training Center will consist of 62 testing labs and 9 research labs. SSOE’s services include programming, conceptual design, master planning, detail design, and construction management. 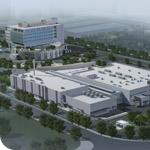 SSOE and GM are anticipating completion of Phase 2 construction to be in the second half of 2012. General Motors has 11 joint ventures, two wholly owned foreign enterprises and more than 35,000 employees in China. GM and its joint ventures offer the broadest lineup of vehicles and brands among automakers in China. Passenger cars and commercial vehicles are sold under the Baojun, Buick, Cadillac, Chevrolet, Jiefang, Opel and Wuling brands. In 2011, GM sold more than 2.5 million vehicles in China. It has been the sales leader among global automakers in the market for seven consecutive years. More information on General Motors in China can be found at GM Media Online.